Ron asks: What causes the “Will O the Wisps”? 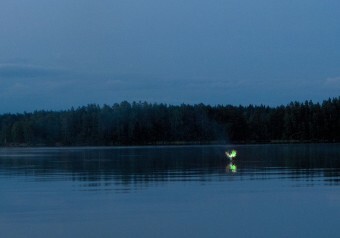 For those who don’t know, Will-o’-the-Wisps, also called “ignis fatuus,” Latin for “foolish fire”, are balls of light that are seen hovering over swamps at night and look similar to flickering lanterns, with the light often being blue in color. Several theories exist as to its cause, including bioluminescence; that is, the glow is caused by something natural like fireflies or honey fungus. Another, somewhat oddball, theory is that barn owls might fly over swampy areas and reflect light from the moon or other sources off of their white plumage, making it look like a bobbing lantern. However, one of the most accepted theories was more or less discovered by Allesandro Volta, who discovered methane in 1776. He believed that lightning mixed with the swamp gases caused the ghost lights. His theory was extremely controversial at the time and often disregarded because of the unlikeliness of spontaneous combustion and because the theory did not explain why Will-o’-the-Wisps appeared to retreat when approached. With technological advances, we can prove Volta’s theory was more or less correct. Will-o’-the-Wisps are caused by burning gases—called “swamp gas” or “marsh gas”—that develops from the breakdown of organic matter in persistently wet areas. The movement of the wisps is usually disregarded and it is explained that the gases disperse when approached because of the movement in the air. The normal decomposition of organic matter in open air is called “aerobic decomposition.” Like all organic matter, plants and animals are largely made up of carbon, hydrogen, and oxygen. When decaying in the presence of oxygen, the by-products of the decomposition are water, carbon dioxide, and energy, or heat. In swampy or marshy areas, aerobic decomposition is often unable to take place. Instead, the dead matter is buried beneath water and saturated soil where it continues to decompose in the absence of air. The matter is broken down by anaerobic bacteria, the by-products of which are methane, carbon dioxide, nitrogen, phosphines, and other chemicals. It is believed that, as the gases rise from the soil and water and escape into the atmosphere, the methane mixes with the phosphines and creates the blue lights seen hovering over the swamps. Phosphines are flammable, toxic gasses that can burst into spontaneous flame in the presence of air. As it burns, it produces a dense white cloud, which could give the flame more substance. Mixed with methane, the effect is the Will-o’-the-Wisps that inspired so many stories. Stories and legends surrounding Will-o’-the-Wisps are present in nearly every culture. In Britain and Ireland, Will-o’-the-Wisps were spirits of the dead who used the lights to lure travelers into treacherous marshes. The spirits could not enter either heaven or hell, and spent their days wandering the earth. Their demeanors range from simply mischievous to malevolent, and they took pleasure in leading people astray and into dangerous situations. Some see Will-o’-the-Wisps as death omens, particularly when they are seen in cemeteries. In Denmark, Will-o’-the-Wisps are called Jack-o-Lanterns. (See Whey Carved Pumpkins are called Jack-o-Lanterns for the origin of the name) They are said to be the spirits of unrighteous men, and the best way to guard against them is to turn one’s hat inside out. In the Netherlands, they are the souls of unbaptized children. They lead travelers to water so that they themselves can be baptized and enter the gates of Heaven, and it is taught that no one should neglect them. In German legends, Will-o’-the-Wisps particularly like tormenting drunks on their way home from the bar. When the drunks stumble and fall, the wisps will burn the soles of their feet. Some believe that you can make wisps disappear by throwing a handful of dirt from a graveyard at them. In Argentina, the Luz Mala (evil light) is greatly feared. Traditionally, they believe that a white light represents a soul in trouble that needs a prayer. However, if the light is red, Satan is tempting the onlooker and it is recommended to flee immediately. In Bengal, Will-o’-the-Wisps are called Aleya, and are thought to be the souls of fishermen who died fishing and attempt to lure other fishermen to their deaths. In Mexico, they are the souls of witches. In Australia, the lights are called “min min lights” and follow people who see them. If the traveler follows the light instead, he will never be seen again. The name “Will O’ the Wisps” has a similar meaning to “Jack O’ Lantern” (“man of the lantern”). In this case, coming from the definition for “wisp” (bundle of sticks or straw used for a torch), thus “Will of the Torch”. In this case, one of the principle legends behind the name concerns Will Smith… no, not that Will Smith, but rather a guy named Will who was a particularly evil blacksmith. There are a variety of versions of this legend, but the basic idea is that when he died and attempted to get into Heaven, Saint Peter gives him a second chance at life, but he blows it and ends up being doomed to walk the Earth forever, not unlike the Irish legend of Stingy Jack. Also like the Jack O’ Lantern legend, the Devil gives Smith an ever burning lump of coal to use as a light. But in this case, it is also to keep Smith warm in cold, damp places like marshes. Allessandro Volta, who discovered methane, also invented the first battery. The volt is named after him. Is this a warm climate thing? Living in a frozen shithole; I have never witnessed such a thing. It’s a swamp thing with rapid decomposition, We have many swamps in my area (North East) and you’ll see these often in the fall. I know this is a slightly old document, but I just want to note that we in Denmark do in fact call Will O the Wisp’s “Lygtemænd” (lantern men), not Jack-O-Lanterns. Otherwise it’s a good article. The comment from Yer Pal (are they seen where the climate is cold?) is interesting: A Franz Schubert song from ‘Winterreise’ (on poems by Karl Lappe) is called ‘Irrlicht’, the German word for Will-of-the-Wisp: The narrator is on a journey through a Winter’s land, where normally you would not expect self-igniting gases to appear? Poems are not supposed to be scientifically correct, but it would be nice to know, anyway. The ‘burning’ of methane by the ‘igniter’ of phosphine is clear to me. It is like the burning of the “wick” of a pocket warmer. Once the methane is “ignited” by the phosphine similar to the glowing burn of a coals in a fire or the glowing wick of a pocket warmer – it just glows – probably ‘hovering’ over the methane/phosphine mix fuel source emerging from the ground or water or where ever the swamp gas was formed. The ‘igniter’ phosphine probably works just like ‘red phosphorous’ that spontaneously ignites upon contact with oxygen – the phosphine igniter is apparently produced anaerobically in the same way and location as the methane fuel – key is: ‘both formed without oxygen’. Both emerge as anaerobically produced gas together with the methane fuel and the phosphine igniter in ‘partnership’. For this phenomena to occur, the air must be very still and probably also some sort of simultaneous temperature inversion condition must exist close to ground level that keeps ‘a lid on’ the gases so they do not disburse until consumed by ‘fire’ or dissipated by rising air movement caused by the ignition of the gases disbursing the gases to a point where there is not adequate ‘fuel’ and the Will ‘O the Wisp ceases. The blue green glow is probably enhanced by ground level fog that is part of the temperature inversion condition that enables this phenomenon to happen. This tender partnership of methane and phosphine is not concentrated enough to burn like methane from an oil well, but is apparently able to ignite in a glow like the wick of a pocket warmer. Because of the ‘ignition’, slight temperature variances are caused to occur in the still air conditions that enable this phenomenon, and the mass of ‘burning’ gas will be caused move to the right and to the left, oscillating to release the small heat energy that it produces. The movement is not dramatically upward because the phenomenon is held in place by the simultaneous temperature inversion that keeps the mass from rising. Were it not for the inversion, the mass of emerging gas would likely dissipate by rising air, even in ‘still air conditions’, and Will ‘O the Wisp would probably never occur. This phenomenon is extraordinary. There is one visible from our family farm in western Kansas. It appears about five miles SW of the house. It has been visible continuously at least since 1918. and who knows how long before that. The swamp gas theory seems unconvincing because, why can’t you see it when you get close? I mean within half a mile? The disappearing act makes it hard to pinpoint exactly where it is, so you can’t test the spot for methane, etc. The one I am referring to constantly flickers, wavers, goes out, comes back. Wouldn’t a methane flame catch the grass on fire? why can’t you see any sign of burning at the spot when you get there? The local name for them is Jack o’ lantern. Well, guess we don’t really have to explain everything. That sounds good but I have been pursued by what I thought were flashlights and I got disoriented and lost in familiar woods. These lights followed a friend and me and we thought we were being chased by people, once we stoped running they stopped coming closer and just hovered about 30 feet out then they disappeared and reappeared behind us off and on till suddenly we recognised the trail we were looking for and made it out of the woods. They had an intelligence about them and we both experienced the same thing and to this day we can’t explain it.